It's been a quiet few weeks, with my reenacting season over with the Battle of the Thames on the first weekend of October. The Garrison Ghost Walk hosted by Fort Meigs is on starting tonight, if you're in the Toledo area. I got around to cleaning my gun this week (a note for all you reenactors: it's fine to call a musket or rifle a "gun" because the original people you represent used that term for both-- just don't go calling a musket a rifle or vice versa!). I was down a sanding sponge, an essential piece of equipment for scouring rust off an "armory bright" (read: no bluing or metal treatment at all) finish on a musket, so I decided that I would have to strip the gun and clean it again shortly thereafter. There was nothing to do but take it out and get it dirty once more! I believe many reenactors have never shot live bullets out of their weapons. There are some pieces I've seen in this hobby that I would never venture to fire live--although, as a rule if you can't trust something at the range you shouldn't trust it with a blank load either. Other people enjoy the hobby mostly as an opportunity to collect guns and hunt or target shoot, dressing up and going to living history events more as as side thing. I like to take my musket out to the shooting range to test military loads and get a feel for what live shooting actually involves, as well as to get another chance to burn gunpowder. Walking onto a modern shooting range with a flintlock musket design more than 200 years old is a bit like bringing a pet dinosaur to a dog show. People used to the stubby, black plastic and stamped metal rifles of today don't know what to make of a five-foot long, bright steel and walnut firearm-that-can-double-as-a-spear. People who shoot or have shot percussion or in-line muzzleloaders are not uncommon, so a second culture shock is the flintlock ignition system. If you think about it, a percussion-lock muzzleloader (just beginning to come into being during the War of 1812 period, but not popular until the 1830s and later) is a deconstructed version of a modern firearm-- instead of having everything packed into a nice, metallic package of primer, cordite and bullet you have a separate primer cap, gunpowder propellant, and ball. The system still works pretty fast. The flintlock, by contrast, uses a bit of the same propellant as a priming, and sets this off in a brilliant smokey flash before burning the main propellant charge. It takes a lot of getting used to: by contrast, when I first shot a .22 calibre semi-automatic rifle, I didn't even realize I had made a few shots until I saw the little pin-prick holes appearing in the target sheet. The flash--and sometimes non-flash-- of the priming requires a flintlock shooter to resist the urge to flinch and thus disturb their aim. A hat with a brim actually helps, kind of like blinders for a horse. At any rate, I took my musket and a cheap wire target holder to the public shooting range at Delaware Wildlife Area, managed by the Ohio Department of Natural Resources. I had made up seven or eight paper cartridges--military style-- each holding a .649 calibre round ball and 120 grains of FFg powder (fairly course stuff for modern shooting but the original cartridges in 1812 would have been made with 160 or so grains of course, unglazed gunpowder). At fifty yards, I fired repeatedly at a white Williams-Sonoma bag without seeming to make a dent. I really need to pick up some field glasses before my next trip to the range! At the last shot, the target collapsed to the ground like a condemned man before a firing squad. At first I thought this was the first time I'd hit the mark in eight shots, but on closer inspection it turned out that the ball had struck the wire target holder itself, twisting and breaking it as it passed through. There were three other holes where balls had passed through, as neatly round as if by a ticket-punch. Each of these was about the diameter of my index finger. I have yet to recover any of my musket balls from the backstop out of consideration for my fellow shooters, but I imagine they look like pancakes once they hit dirt. Next time I'll try a political yard sign-sized target at 100 yards, and see if the smooth bore can touch it. If I can find some, I shall add 3 no. 4 or T gauge buckshot to the musket ball, and see how that does. This "buck and ball" cartridge was the standby of the American infantry until the end of the Civil War. People on both sides of the political spectrum dismayed at the dysfunction exhibited by Congress lately shouldn't be-- the incompetence of the legislative process goes back to the Continental Congress of the 1770s and it's a wonder that we were able to sufficiently organize ourselves enough to break free of Great Britain. The War of 1812 was no exception. Our legislative branch picked another fight with one of the better (I shan't say best) run military powers of the world and haphazardly struggled to reorganize the tiny US Army; to clothe, feed and pay for it. One of the few Federal services to stay up this past two weeks was the Library of Congress, for the simple fact that it might be needed for consultation by the legislators. Thus I was able to browse through the American State Papers, the collected documentation produced by Congress as it has deliberated on all sorts of legislation down through the years. The volumes on Military Affairs are a good source for reports on battles, clothing, regulations, and anything else related to the American field armies. Among the odd minutiae you find here are facts such as how much the West Point math professor made (40 dollars a month--pg. 435) or how many women were authorized (read: given rations--there may have been more women paying their own way) in proportion to men (one women was allowed for every seventeen men-- pg. 436). 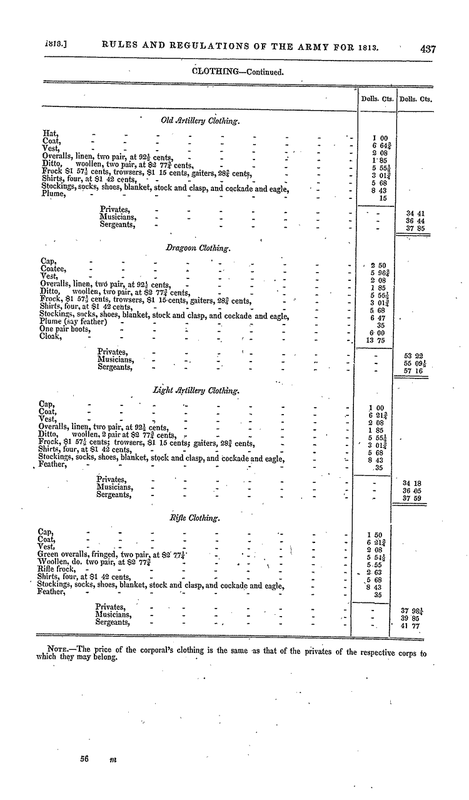 One of the more interesting items from 1813 were tables, presumably drawn up by the Commissary General of Purchases, Callendar Irvine in Philedelphia. 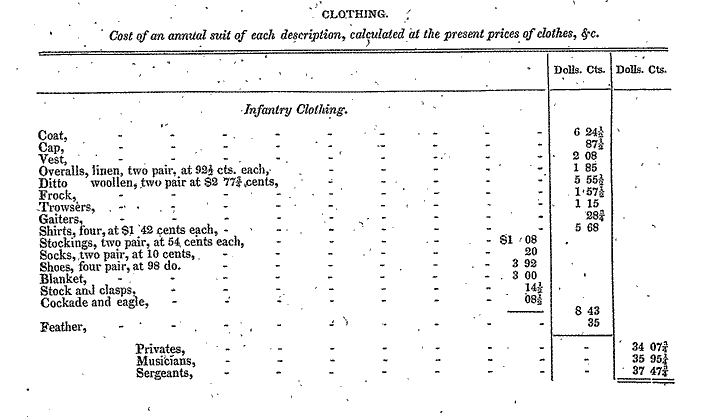 These list the cost of each uniform item issued to US soldiers. 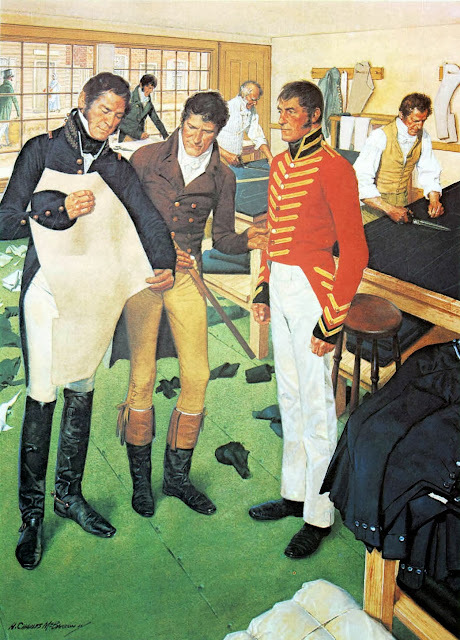 They also compare the "old" Artillery uniform of 1812 with the cheaper ones devised for 1813. Within three years or so the Army went through three different uniforms, getting cheaper every time. They ended up with what Renee Chartrand has called "impressive sobriety... American soldiers have since favored a simple, practical, and comfortable uniform that has given them an air of respect and efficiency. (Chartrand, A Most Warlike Appearance, pg. 62).